TORONTO — Due to popular demand, the Art Gallery of Ontario (AGO) is staying open late six evenings this fall to ensure that all Torontonians get to see the glittering exhibition David Bowie is during its only Canadian stop. The exhibition will close on Nov. 27. Hailed by the Toronto Star as “monumental” and as a “multimedia extravaganza” by NOW Magazine, the exhibitions hours will be extended to meet demand. In addition to the AGO’s usual late Wednesday nights, the Gallery will remain open until 8:30 p.m. on Oct. 19 and 26 and Nov. 2, 8, 9 and 15. The Gallery has also added special viewings for members on Oct. 18 and Nov. 1. With only seven weeks remaining in the exhibition’s run, visitors can now purchase from the final block of tickets for David Bowie is. These tickets offer one-time admission to the exhibition up until Nov. 27, 2013, and can be purchased in person, online and over the phone. Due to the high volume of demand for this exhibition, visitors are encouraged to consider booking weekday daytime visits. Toronto is the first and only Canadian stop on the exhibition’s world tour. 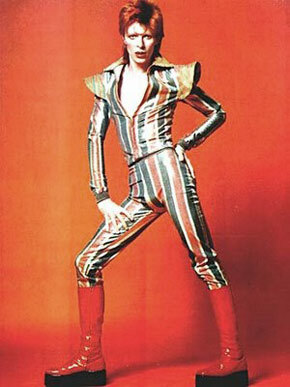 Organized by the Victoria and Albert Museum, London, this is the first museum show to feature such a broad collection of artworks, artifacts and costumes from the David Bowie Archive. Exploring how the multi-talented performer has both influenced and been influenced by movements in art, design, fashion, theatre and contemporary culture, David Bowie is attracted around 312,000 visitors during its debut at the V&A. A richly illustrated catalogue edited by exhibition curators Victoria Broackes and Geoffrey Marsh accompanies the exhibition. Single timed-entry tickets for David Bowie is are $21.50 for youth ages 17 and under, $26.50 for seniors and $30 for adults. Admission is FREE for AGO members and for children five and under. Tickets in the first block offer one-time admission to the exhibition from Oct. 21 to Nov. 27, 2013. Tickets for David Bowie is can be booked in person, by phone at (416) 979-6655 and online by visiting ago.net/david-bowie-is. For more information on becoming an AGO member to get free admission to all exhibitions at the AGO, please visit ago.net/membership. The AGO’s acclaimed restaurant, FRANK, celebrates David Bowie is with a selection of updated British comfort foods. These Bowie-themed dishes include FRANK-style fish and chips and lobster pie. FRANK restaurant at the AGO will be open for dinner during the exhibition’s extended hours. For reservations please call 416.979.6688. To ensure the best audio experience for visitors, the AGO is working in partnership with audio specialist Sennheiser. “We are extremely pleased to work with the renowned Art Gallery of Ontario on this outstanding exhibition,” said Paul Whiting, President of Global Sales at Sennheiser. “We will not only bring equipment to this exhibition but also our audio expertise offering visitors an immersive 3DAudio experience.” The Sennheiser Group, with its headquarters in Wedemark near Hanover, Germany, is one of the world’s leading manufacturers of microphones, headphones and wireless transmission systems. The family-owned company, which was established in 1945, employs more than 2,100 people worldwide, and has manufacturing plants in Germany, Ireland and the U.S. Sennheiser is represented by subsidiaries and partners worldwide. Also part of the Sennheiser Group are Georg Neumann GmbH, Berlin (studio microphones and monitor loudspeakers), and the joint venture Sennheiser Communications A/S (headsets for PCs, offices and call centres).